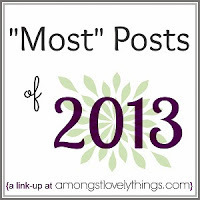 Today I'm linking up with Amongst Lovely Things to share some of my favorite posts from 2013. I've made several trips to the post office in the past few days, mailing support letters from members of our mission trip team to their family and friends, asking them to support their trip prayerfully and/or financially. I'm currently knee-deep in mission trip preparations for my team's 2014 trip to Rwanda. As part of this mission trip preparation, I'm working hard to shatter any Messiah complexes my team members might have. I spent five years working at a multi-ethnic, multi-site congregation. 19 years ago yesterday, my Grandma died. Yesterday, worship was more crowded than usual. As a result, by the time I finished getting ready for Sunday school and then snuck into our sanctuary, my usual seat was taken, leaving me with no choice but to sit somewhere new. I do not generally enjoy books on prayer. Oh believe me, I've read my fair share – for small groups, class, and work. Most in the youth ministry world are aware of both research and anecdotes suggesting millennials are leaving the church. When The Five Love Languages was all the rage, I bought a copy, thinking it would be a great book for my husband and I to read together. True confession: We never did. In the last two weeks, an important conversation has been happening in the virtual world about women in the church.